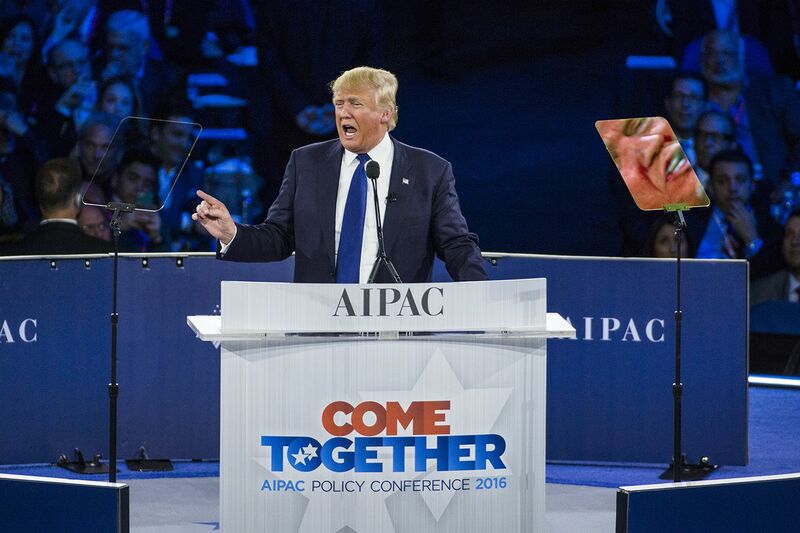 In late March, some 18,000 people crowded into a grand ballroom the size of a commercial airline hangar in downtown Washington, D.C., for the annual conference of the American Israel Public Affairs Committee (AIPAC), the largest pro-Israel lobby in the United States. Behind the stage were a dozen Jumbotrons, which, in between the speeches, broadcast short propaganda films about daily life in Israel. In some, Israelis residing close to the Gaza Strip described their experiences of living under Hamas rocket fire. Others showed Israeli agricultural fields being consumed by huge fires, caused by Hamas-launched kites carrying burning, gasoline-­soaked rags. 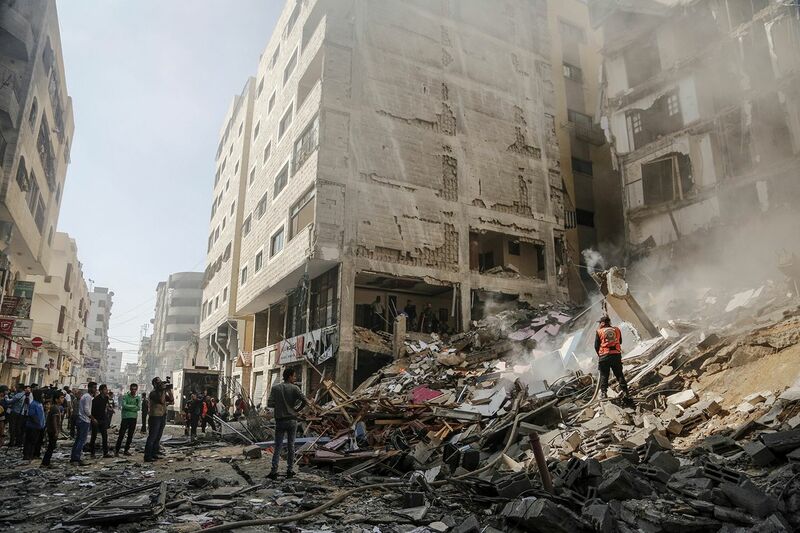 Still others showed elaborate Hamas tunnels that ­Israeli security forces had discovered. Whenever there was downtime, ­Israeli songs blared through the sound system. The effect was total immersion—sight, sound and speeches—in a pro-Israel experience. The event is traditionally a rare bipartisan affair, with both ­Republican and Democratic leaders heaping praise on the U.S.-­Israel alliance and each pronouncement of the two countries’ strategic and cultural affinity prompting wild applause. But this year, when Republicans hit the stage, they dispensed with the usual comity. Speaker after speaker claimed anti-Semitism had infected the entire Democratic Party—one of the most toxic charges in American politics. “It’s astonishing to think that the ­party of Harry Truman, which did so much to help create the state of Israel, has been co-opted by people who promote rank anti-­Semitic rhetoric and work to undermine the broad American consensus of support for Israel,” said Vice President Mike Pence. Later, Secretary of State Mike Pompeo charged that some congressional Democrats “think anti-Semitism can actually win them votes,” and Senate Majority Leader Mitch McConnell told the audience that hatred of Jews and Israel is “increasingly shaping the left’s agenda.” With each verbal assault, many in the audience cheered. 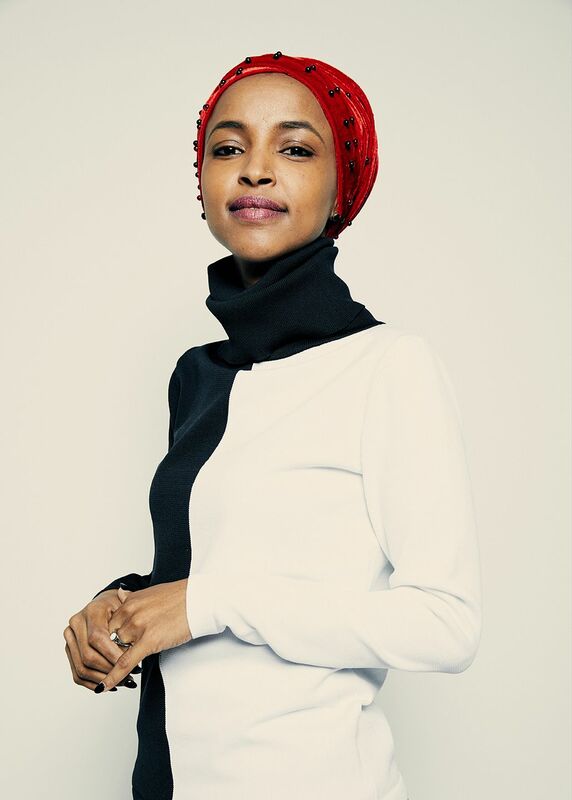 For Republican leaders, Exhibit A was a 37-year-old Demo­cratic freshman: Ilhan Omar, who, in just a few months, has become perhaps the most controversial member of the progressive caucus. One of the first two Muslim women ever elected to Congress, Omar has attacked both harsh Israeli policies toward the Palestinians and AIPAC’s power in Washington, at times, using language easily regarded as anti-Semitic. 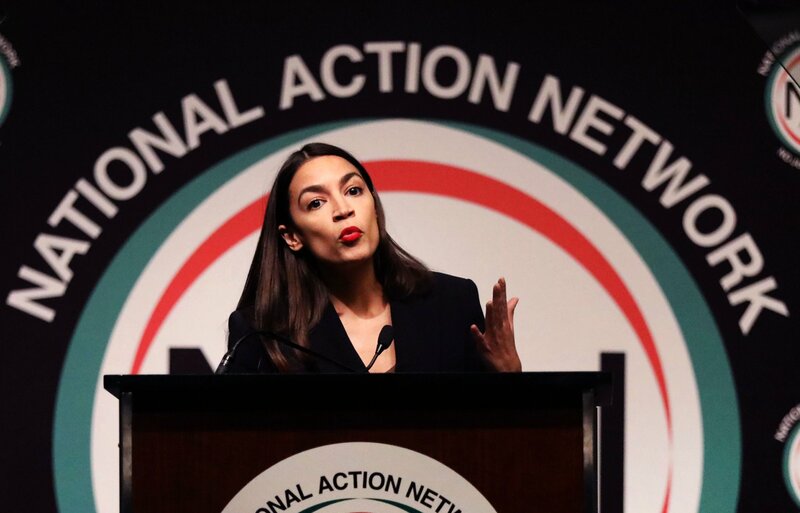 “It’s all about the Benjamins baby,” she tweeted six weeks before the conference, breezily referring to $100 bills that AIPAC lobbyists spend to fund pro-Israel lawmakers. Omar apologized for that remark after a storm of accusations—including from Democratic leaders—that she was employing an old ethnic slur regarding Jews and money. Only two weeks later, after Omar questioned the fealty that American Jews show to Israel, her critics seized on her suggestion of dual loyalty as yet another anti-Jewish insult. This time, she refused to apologize. Omar, a Somali war refugee, and her fellow Muslim freshman, Representative Rashida Tlaib of Michigan, are speaking out as ­never before against Israel’s 52-year occupation of the West Bank, U.S. financial and political support of the Jewish state, and discrimination against Muslims in the United States. 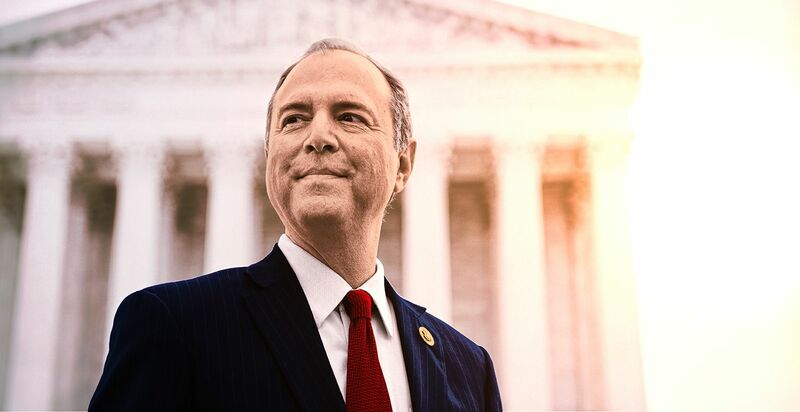 Their ­remarks have fractured the Democratic Party, with older, mainstream members like House Speaker Nancy Pelosi and nearly all the ­party’s Jewish ­lawmakers condemning their remarks. 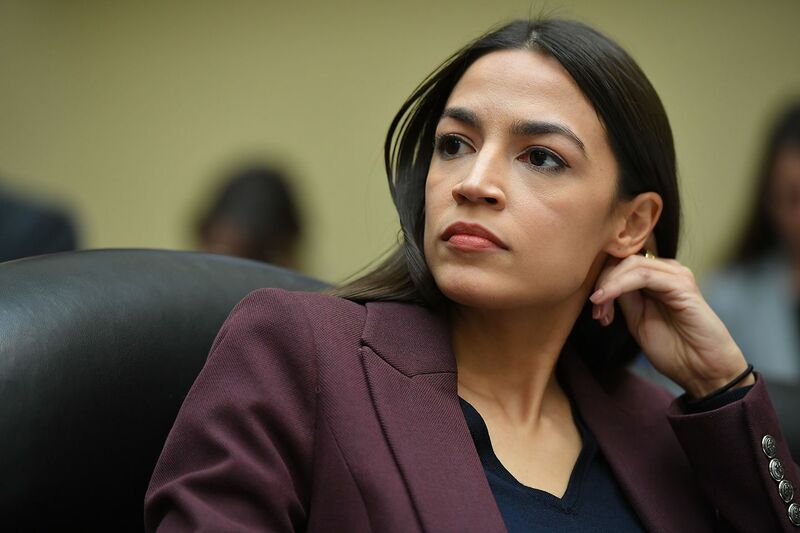 But prominent progressives, including Senator Bernie Sanders of Vermont and Representative Alexandria Ocasio-Cortez of New York, defend them. To be sure, Omar and Tlaib are no friends of Israel. And while defenders acknowledge they could be more sensitive in their language, they reject the accusation that they’re anti-Semites. All of a sudden, Israel has become as partisan an issue as immi­gration and health care. As Republicans demonstrated in their AIPAC speeches, the congresswomen have become useful foils in their campaign for the 2020 elections. With their push to paint the entire Democratic Party as anti-Semitic and anti-Israeli, ­Republicans hope to siphon enough votes and campaign donations from one of the most loyal Democratic groups to turn toss-up congressional districts and battleground states red. Such victories, they hope, could help guarantee the re-election of President Donald Trump, continued Republican control over the Senate or enough gains in the House to reclaim GOP control. The election outcome could have profound impact on foreign policy. If Trump wins, he’s likely to double down on his staunch support for Israel, although one never knows with Trump. If a Democrat wins, the influence of progressives like Omar could lead to previously unthinkable changes to the U.S.-Israel relationship amid a post-Trump backlash. If the conversation about Israel has been, until now, mostly one-sided, few can claim more credit than AIPAC. Those who have challenged Israeli policies often find themselves on the wrong end of the organization’s formidable political operation. In perhaps the most storied case, AIPAC activists in 1984 targeted Senator Charles Percy of Illinois, then the chairman of the Senate Foreign Relations Committee. 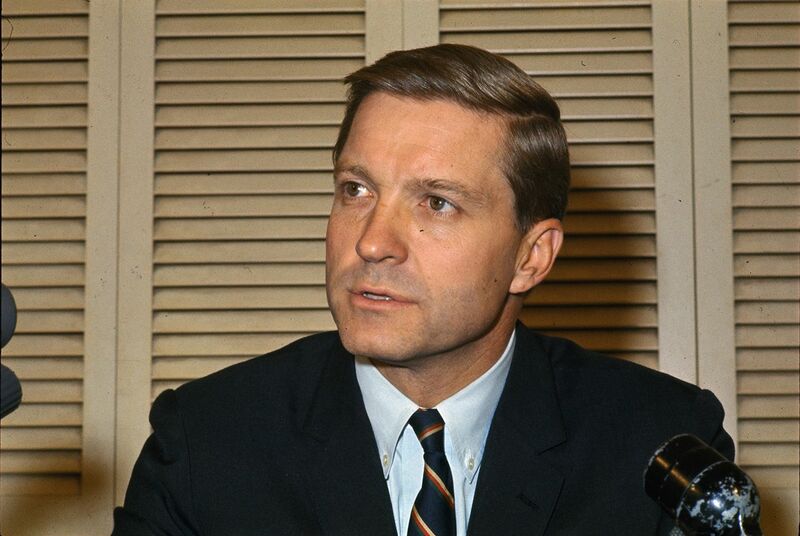 Percy had defied Israel on a handful of issues, most memorably by supporting the U.S. sale of AWACS early-warning aircraft to Saudi Arabia—a weapons sale Israel and AIPAC vehemently opposed but which narrowly cleared the Senate by a two-vote margin, thanks largely to Percy’s influential endorsement as head of the panel that oversees such sales. In response, AIPAC board member Robert Asher persuaded liberal Democratic congressman Paul Simon to run against Percy, Simon later wrote in his autobiography. With AIPAC’s encouragement, pro-Israel PACs and wealthy American Jews provided Simon with $3.1 million—fully 40 percent of his war chest. A single Jewish activist alone financed $1.6 million worth of attack ads against Percy. Simon received 65 percent of the Jewish vote to Percy’s 35 percent, which proved decisive in Simon’s victory. Percy’s defeat established AIPAC as a powerful political force that lawmakers crossed at their own peril. Since then, the lobby has helped shape a reliably pro-Israel House and Senate, winning broad bipartisan support every year for foreign aid appropriations, out of which Israel receives more than $3 billion in security assistance annually, making it the largest recipient of U.S. foreign largess. The Obama administration took a far tougher line with Israel, reflecting Democratic disillusionment that had been quietly building for years. Policy toward Israel became a partisan issue in March 2015, after Obama reached an agreement with Iran that curtailed its nuclear program in exchange for sanctions relief. 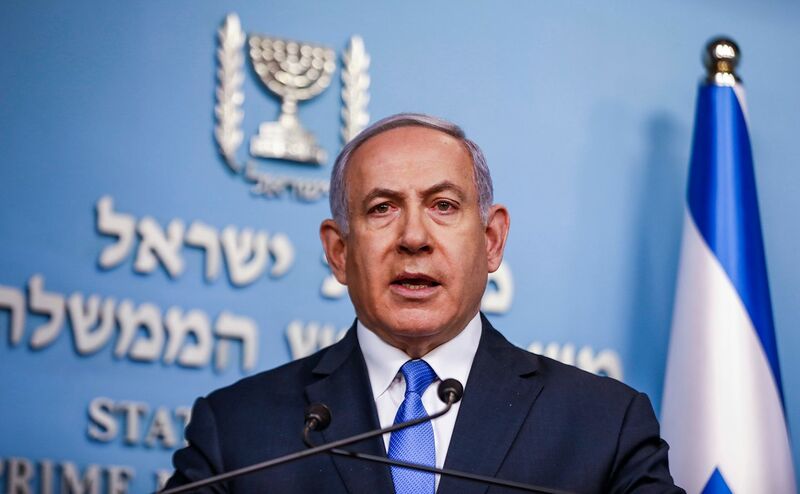 At the invitation of the Republicans who then ran the House, ­Israeli Prime Minister Benjamin Netanyahu delivered a fiery speech ­before a joint meeting of Congress urging lawmakers to oppose the deal. Dozens of Democrats defiantly boycotted his speech. Netanyahu has openly aligned himself with Trump and the ­Republicans. In turn, the president, defying decades of U.S. policy, recognized Jerusalem as the capital of Israel and opened an embassy there last year. In March, Trump recognized Israeli sovereignty over the Golan Heights, which Israel captured in the 1967 Middle East war. He also has cut off aid to the Palestinians, closed Palestinian offices in Washington and sided with Israel in its continuing clashes with militants in Gaza. The diminutive Omar has emerged as the most voluble—and visible—of Israel’s critics. She appears to embrace the role of a political provocateur, particularly when it comes to foreign policy. Omar articulates a view that is rarely heard from a sitting member of Congress, one that has been forged from her first-hand experiences of war and exile. Born into a prosperous family in Mogadishu, the Somali capital, she was a child when civil war erupted in the 1980s. In interviews, she has said her earliest memories recall her fears as she huddled in her room, listening to the muffled thud of mortars firing and the ear-shattering blasts of shells landing nearby. At age 7, she and her family fled to neighboring Kenya, where they lived in a squalid refugee camp for four years. 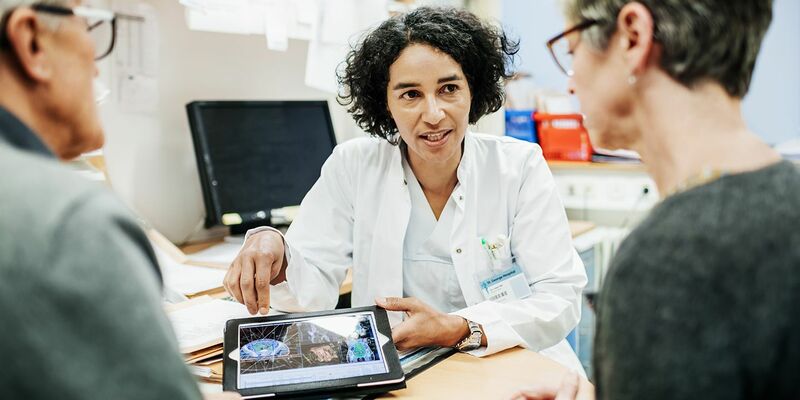 “I experienced and witnessed unspeakable suffering from those who, like me, had lost everything because of war,” she recalled in a commentary published last month in The Washington Post. One of her few fond memories of the camp was the films she watched that showed manicured American towns. “I dreamed of one day coming to the United States of America—a land that promised peace and opportunity regardless of one’s faith or ethnicity,” she wrote. Granted asylum as refugees, Omar and her family moved to the United States in 1992. Arriving in New York, Omar has said she was confused when she saw trash and homeless people in the streets—her first brush with the American underbelly. The family continued on to Minneapolis, where they settled among the city’s large Somali population. 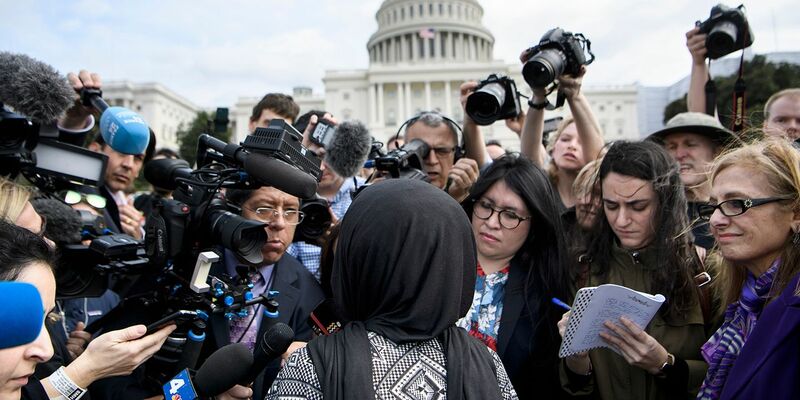 After 9/11, Omar donned the hijab, not so much out of religious conviction, she has said, as from a determination to show her cultural identity at a time when many Americans viewed Muslims with suspicion. A mother of three children by the time she was in her 20s, Omar enrolled at North Dakota State University, graduating in 2011. She then became involved in politics, first volunteering for local and state legislative campaigns, then working as an aide to a Minneapolis city councilman before running for a seat in the Minnesota Legislature herself. She won that contest in 2016 after campaigning on a progressive platform. After only a year and a half, she ran in 2018 for the open U.S. congressional seat for Minnesota’s 5th District, which includes Minneapolis and some suburbs. She won, joining the Democratic freshman class that wrested control of the House from the Republicans. 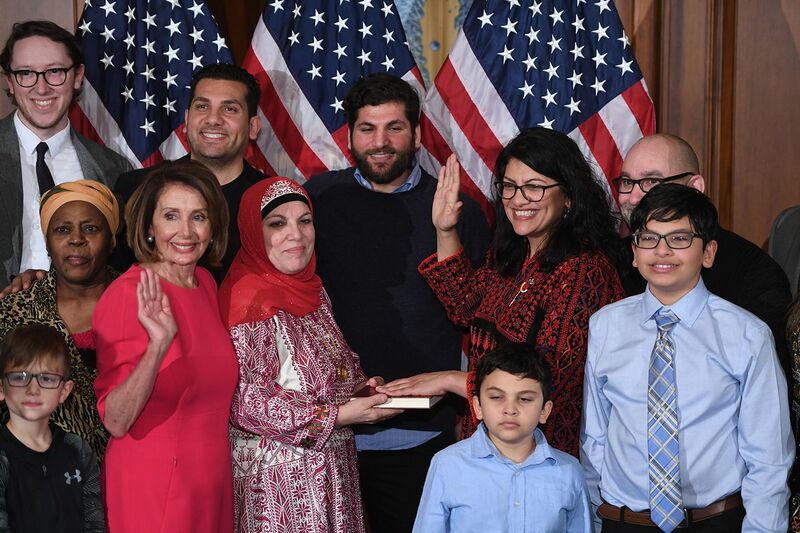 James Zogby, president of the Arab American Institute, a nationwide organization that promotes the community’s participation in politics, says Omar and Tlaib are emblematic of a new generation of young Arab Americans who don’t carry the immigrant baggage of their parents and grandparents. 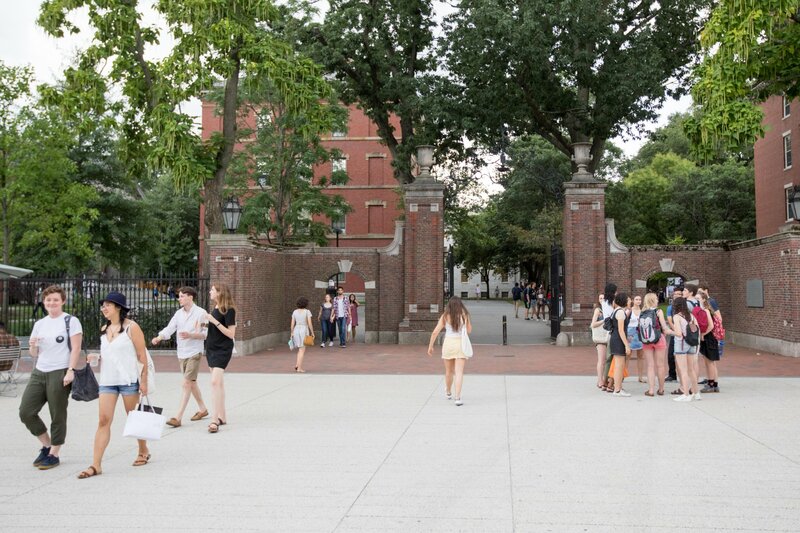 On college campuses, in city and state governments, and now in the U.S. Congress, these young Arabs not only assert their ethnic identity; they’re also not afraid to speak out against the Trump administration’s immigration policies and its support of the Saudi-led war in Yemen, or to confront a much wealthier and better organized Jewish community over the issue of Israel. Moreover, Zogby adds, on these and other issues, Arab American activists have formed coalitions with other groups representing ethnic, racial and religious minorities, such as Black Lives Matter and even some left-wing Jewish groups that oppose the Israeli occupation. Taking a seat on the House Foreign Affairs Committee, Omar quickly established herself as an independent voice on the issue of U.S. foreign policy, approaching it from the view of those who have been victimized by war and U.S. policies abroad. At a committee hearing in February, she mauled Elliot Abrams, a controversial figure from the Iran-Contra scandal of the 1980s, who later pleaded guilty to lying to Congress, before being pardoned by President George H.W. Bush. Today, he’s Trump’s special envoy for Venezuela. “That’s a ridiculous question,” Abrams snorted. “Yes or no?” Omar persisted. Just weeks after she was sworn in in January, a tweet surfaced that Omar had posted in 2012 during one of Israel’s retaliatory bombardments of the Gaza Strip. “Israel has hypnotized the world, may Allah awaken the people and help them see the evil doings of Israel,” she wrote. The reaction was swift and fierce. Critics called her language anti-Semitic, accusing her of trafficking in the age-old canard of the Jews’ power to inveigle others. Omar deleted the tweet and apologized, saying she was unaware her reference to hypnosis carried anti-Semitic freight. A month later, however, she sparked more outrage with the “Benjamins” tweet about the power of Jewish money. Omar was forced to ­apologize a second time. But she pointedly refused to back away from her complaint about AIPAC’s financial clout. AIPAC, in fact, does not endorse or raise money for candidates; its acronym stands for the American Israel Public Affairs Committee—not to be confused with a political action committee, or PAC, whose primary fundraising task for candidates would be illegal under AIPAC’s tax-free status. 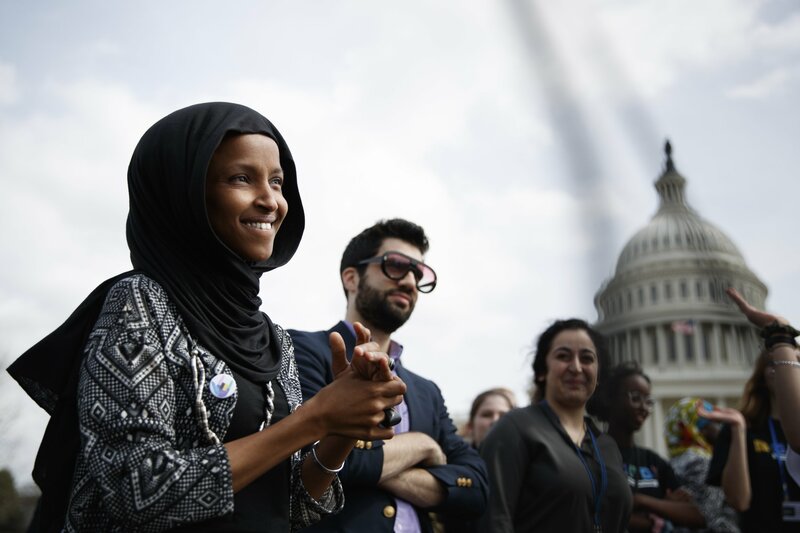 But according to M.J. Rosenberg, a former AIPAC staffer who has become one of the lobby’s harshest detractors, Omar’s observation about the organization’s influence is right on target. In an article in The Nation, Rosenberg wrote that he “personally witnessed the whole process of funding and defunding” candidates. “I sat in AIPAC staff meetings at which the political director discussed whom ‘we’ would be supporting in this campaign and whom ‘we’ were going to ‘destroy’ in that one,” he wrote. While AIPAC doesn’t directly raise funds for candidates, Rosenberg explained, it researches and collects information on candidates—such as their voting record on Israel-related legislation, relevant speeches, and travel and meetings in the Middle East—and delivers it to pro-Israel activists, essentially guiding their campaign donations toward friendly candidates. Omar has called on the Trump administration to apply a consistent, principled human rights standard, stressing that if the United States is to have any credibility abroad, the administration must condemn not only the violations of hostile governments such as Iran and Venezuela, but also those committed by allies like Saudi Arabia. To the small number of Israel critics in Congress, Omar and her progressive colleagues are a revelation. Representative Betty McCollum of Minnesota told Vice News that Israel’s “apartheid-like policies” were antagonizing a growing number of ­Democrats and other Americans. 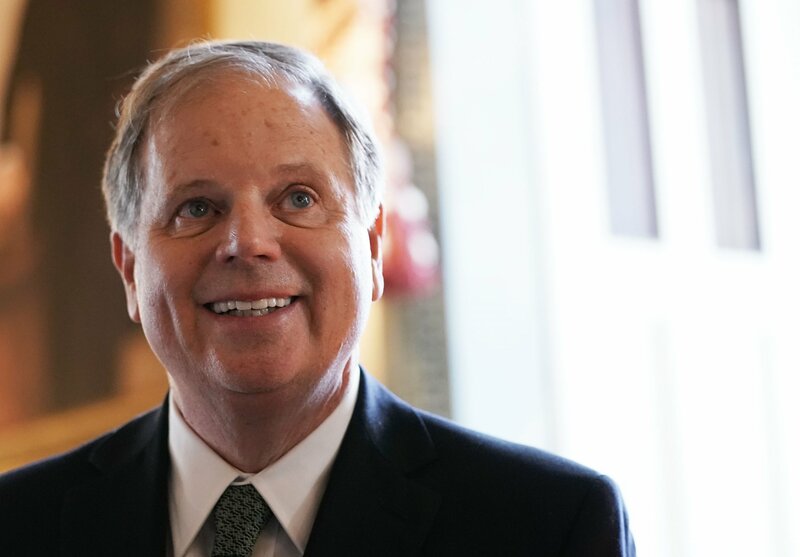 “What has changed is that there are now members of Congress who are not willing to ignore the Israeli government’s destructive actions because they are afraid of losing an election,” McCollum said. In response to McCollum’s “apartheid” remarks, Mellman ­issued a statement, accusing the representative of anti-Semitism. Such ­reactions have drawn derision from progressives on Twitter. “You’re not fooling anyone with this farce,” tweeted one respondent. At a town hall meeting that took place in a hip Washington bookstore just two weeks after her “Benjamins” tweet, she provoked yet another round of allegations of anti-Semitism when she said pro-Israel organizations in the United States “push for allegiance to a foreign country.” House Foreign Affairs Committee Chairman Eliot Engel, a fellow Democrat, demanded Omar apologize for her “vile anti-Semitic slur,” and New York Representative Nita Lowey urged her to meet with members of the Jewish community to learn why they found such accusations of dual loyalty so hurtful. 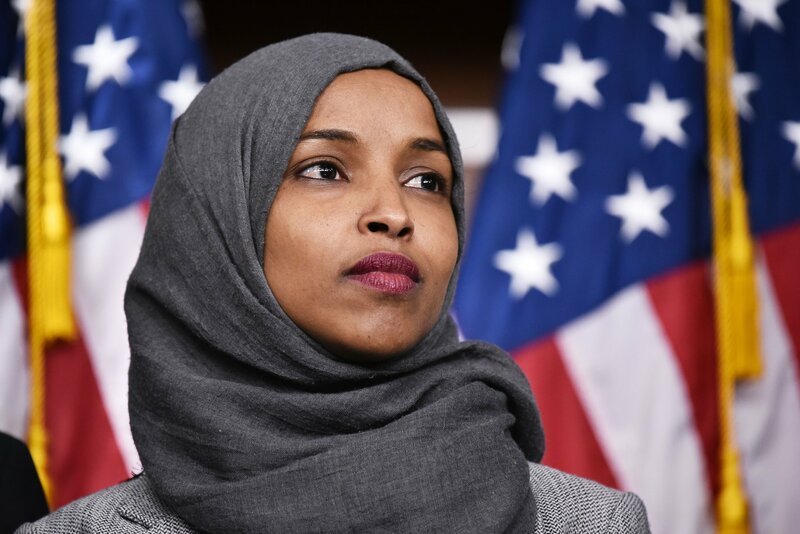 With pressure building, the House Democratic leadership summoned the party caucus in late March to consider a resolution condemning Omar by name for what they regarded as her anti-Semitic remarks. But party progressives pushed back, protesting she was under fire primarily for criticizing Israel. Moreover, they argued, she had been singled out because she was Muslim and black. If the House was going to condemn anti-Semitism, it also had to condemn Islamophobia, these lawmakers said, citing a poster at a recent GOP event in the West Virginia Legislature that juxtaposed an image of the burning World Trade Center with an Omar photo. In the end, the resolution denounced anti-Semitism, as well as bigotry against Muslims and other religious groups, African Americans, Asian Americans, Native Americans, immigrants, Pacific Islanders and LGBT people. It passed the House by a vote of 407 to 23, with all Democrats in attendance unanimous in their support. The resolution, however, has only deepened the partisan ­divide over Israel, and the threats against Omar keep coming. 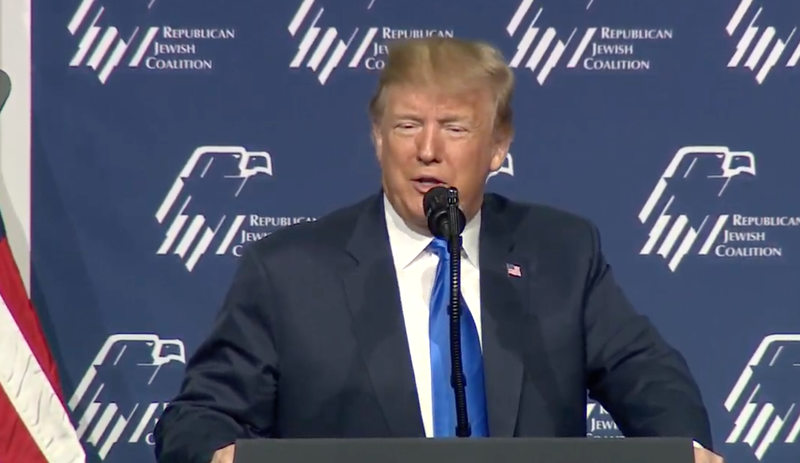 In April, police arrested another man who called Omar’s office and threatened to “put a bullet in her skull;” he labeled her a “terrorist.” The next day, Trump made a sarcastic reference to Omar in a campaign speech to Jewish Republicans in Las Vegas. 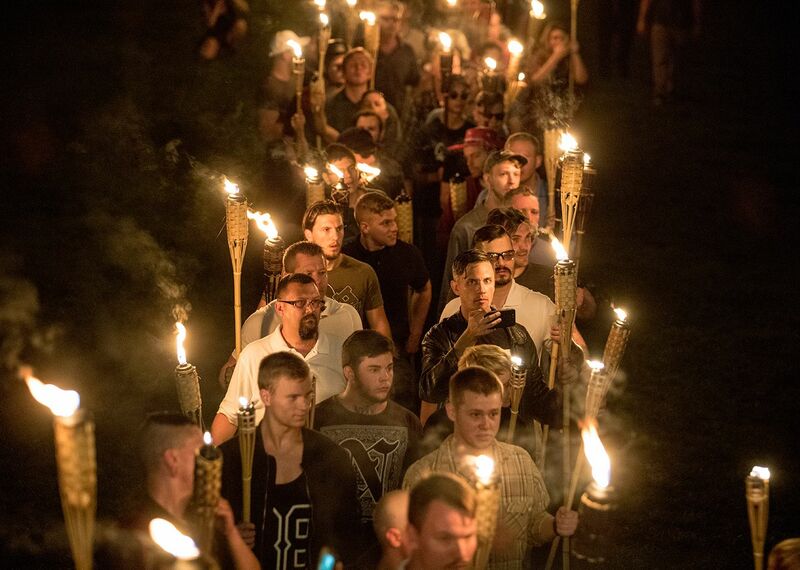 With the 2020 ­election cycle now underway, GOP leaders are seizing upon the broader anti-bigotry measure, as well as Omar’s comments, to put in motion their election strategy of tarring all Democrats as both anti-Israeli and anti-Semitic. Republicans are basing their strategy in part on polls that show far greater sympathy for Israel among Republican voters than Democrats. A 2018 Pew Research Center poll showed 79 percent of Republicans said they sympathized more with Israel than with Palestinians, compared with just 27 percent of Democrats. Pew said the partisan divide over the issue was wider than at any time in the past 40 years. A huge component of Israel’s supporters are evangelical Christians, who make up a third of the Republican base. But a couple of political realities should give Republicans pause. American Jews are not single-issue voters and don’t choose their presidents on the basis of their pro-Israel sympathies alone. And most Jews historically vote Democratic. 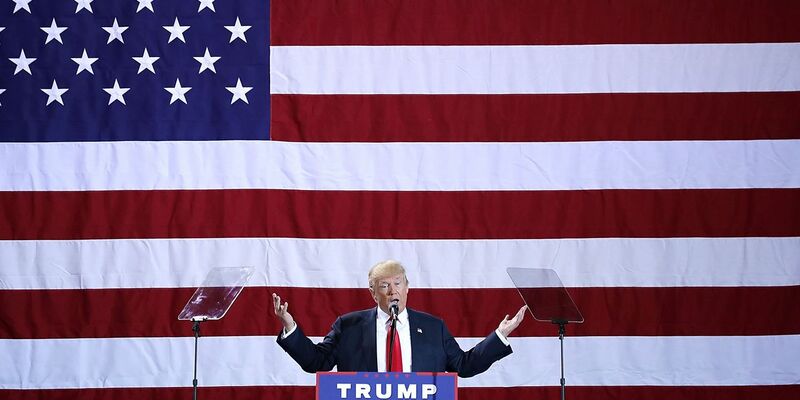 In the 2016 presidential election, 68 percent of Jews voted for Hillary Clinton, while only 28 percent chose Trump, according to a GBA Strategies poll. A Pew poll showed Obama captured 69 percent of the Jewish vote in 2012 and 74 percent in 2008. Trump also has depicted Jews as “globalists,” using their power for their own enrichment. The final television ad of his 2016 campaign showed images of the Hungarian-born financier George Soros; Janet Yellen, then-chairwoman of the Federal Reserve; and Lloyd Blankfein, then-chairman of Goldman Sachs—all Jews—as Trump warned of the “global special interests.” Shadowy figures “partner with these people who don’t have your good in mind,” he said. McCarthy, the House minority leader, also has offended Jews. Just before the midterm election last ­November, he tweeted, “We cannot allow Soros, [Tom] Steyer, and [Michael] Bloomberg to BUY this election! Get out and vote Republican November 6th. #MAGA.” All three are wealthy Jewish donors to Democratic candidates. McCarthy deleted the tweet but strongly denied any anti-Semitic intent. Omar was wrong to suggest that U.S. support for Israel is only about money, Rosenberg wrote in The Nation article. There are plenty of other reasons why the United States has allied itself with Israel over the past 70 years, ranging from Cold War strategic considerations to modern-day intelligence sharing against terrorists and Iran. But a major reason, Rosenberg noted, is the Holocaust, which underscored the need for a safe Jewish state. Inci­dents such as the white supremacist gunman who attacked the Tree of Life synagogue in Pittsburgh during Sabbath services last October, killing 11 worshipers, only reinforce that reason. 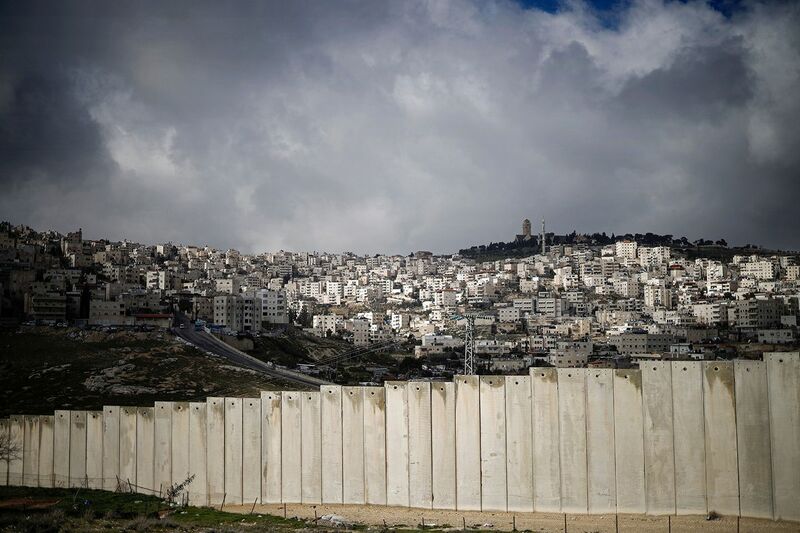 But Rosenberg also argued the continuing need for a Jewish safe haven doesn’t mean Israel must maintain its occupation of the West Bank and deny the Palestinians their own state on those lands. And, he added, it certainly doesn’t mean a U.S. policy of uncon­ditional support for Israel’s right-wing Netanyahu government. Rubio and West Virginia Democratic Senator Joe Manchin, has already passed the Senate. But significantly, nearly half the Democratic caucus voted against it, including all the senators running for the presidency in 2020, with the exception of Amy Klobuchar of Minnesota. Each of the senators who voted against the measure cited its infringement on the First Amendment right to free speech as the reason for their opposition. “While I do not support the BDS movement, we must defend every American’s constitutional right to peacefully engage in political activity,” Sanders tweeted.